We had a great year of Business After Hours! With all the festivals we have at the end of the year we will help whoever wants to have one. Otherwise, we strongly encourage to choose which month you would like to do your BAH in 2019! If you would like to be on the schedule to be a business for the After Hours Program, contact Sarah Pratt at 406-720-0837 or president@chinookmontana.com . Business After Hours is a monthly networking event with 50+ attendees and it is held at a variety of Chamber Member locations throughout the year, to help you connect with potential new customers. Chamber after hours gives our Local Businesses a chance to introduce themselves, their staff, and any new old or special promotions they have to offer to the community! A Chamber Representative will welcome the guests to the host after a brief explanation of what Chamber after hours is all about. The host can start by making any announcements, and have tours of the building as well as introducing the staff. Stay for 20 minutes or stay the full two hours. There will also be a place to sign up for future emails, or to even become a member of the Local Chamber of Commerce. Business after hours is a great way to open your business up to the public (including other businesses) to showcase your business face to face. We all know that this is the most productive way to catch the public’s attention. Give people the chance to get to know you so they will want to do business with you in the future!! Who Will Show Up and Who Will Help? All Chinook Chamber members are sent out an email, there will also be an ad in the paper as well. If anyone has emails of people that are not chamber members we will gladly send them the information to this event. The chamber after hour’s committee is behind the scenes of this, we send out the information to the Businesses to get them to open their doors to the public, along with sending out emails and fliers to get the public aware of this awesome new event. At the end of this event the host will receive the list of attendees and the email addresses as well. 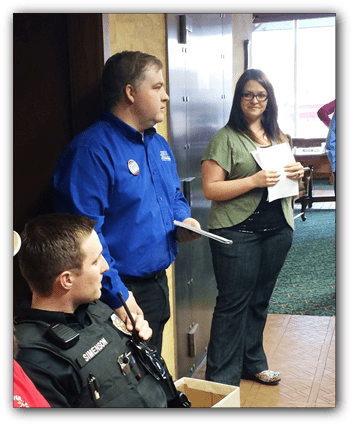 Jennifer Hellman, Business After Hours Administrator and Craig Lowham of 1st Bank of Montana speak about the program at the first Business After Hours event, April 2014 in Chinook. Chamber after hours is held at your place of business during the First Thursday of every month from 6:00pm till 8:00pm. The business community and the public can come and see where you are located and interact with your staff. You are responsible for providing any refreshments or hors d’oeuvres. Door prizes add a great finale to the business presentation. What Does the Business Need to Do? Invitations- Via E-mail to everyone on the Chinook Area Chamber of Commerce membership list. If you need extra emails sent out you will need to inform the Chamber and those we will get out ASAP. Please contact our secretary at info@chinookmontana.com. Refreshments or snacks - This you can do at your discretion. The Chamber membership list is well over 100 members, but this is not a guaranteed number of attendees. The attendance may average between 30-50 people. Speaking Image - What sets your business apart from everyone else? What kinds of services do you provide? This is a great time to showcase anything new and interesting!!! Putting together some background on the building or when you started your business is a great way to start! All you need is the time and the energy to put it together. We, The Chamber, will ensure that your Chamber After Hours is a successful event!